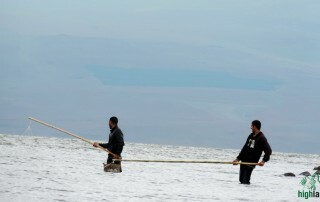 Georgia is recognized as cradle of wine, winemaking was born on this fertile land 8000 years ago. In Georgia wine is produced using modern European technologies as according ancient traditions in clay wine jars – Kvevri. 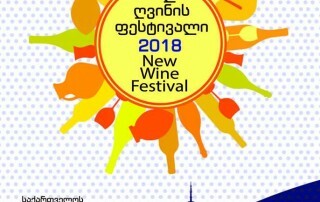 There are plenty pretty famous Georgian wines, mostly from Kakheti region, like Saperavi, Rkatsiteli, Kisi or Mukuzani, but very few knows wines from western Georgia, which are very different. During our wine tour in Wester Georgia we will travel to motherland of Khvanchkara wine and get familiar with other, very rare and unique wines. Morning in Kutaisi we will start exploring old city center and major attraction – Bagrati cathedral church, which was restored pretty recently and named after king Bagrat III – first king of Georgia from Bagrationi dynasty who unified Georgia. Next we will have short drive to approach Gelati monastery crown of Georgian medieval architecture, which is connected with another great king of Georgia David IV. After enjoying cultural sight seeings its time to drive to town Terjola. On the way we will enjoy nature at Dzusa waterfall. First winery awaits us in Terjola, where hospitable wine maker will show us around and there we will have dinner. Here we will try local wines – white dry Tsitska, Krakhuna – amber dry and semi-sweet red Otskhanuri. Tonight we will stay at this wonderful place. Today we will travel off beaten trek to region Racha. We will cross Nakerala pass (1500m) and enjoy picturesque views to Kolkhida valley from Tskhrajvari mountain. After the pass we will see beautiful Shaori water reservoir. Next from Shaori we will see marvelous church with unique frescoes Nikortsminda. 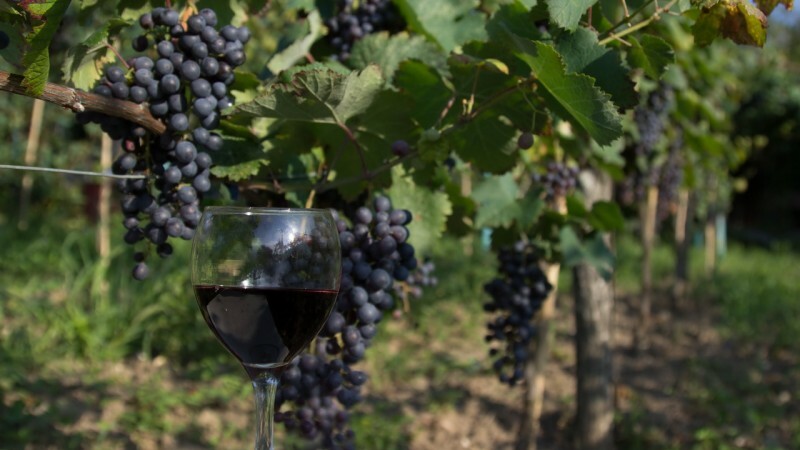 We will arrive to town Ambrolauri – administrative center of Racha region and soon we will see vineyards in Khvanchkara micro zone, where in Rioni valley grows Alexandrouli and Mujuretuli grapes, these verities are used to make famous red semi-sweet wine Khvanchkara. For dinner and to taste fantastic wine, and relax we will go to Chateau Dio. Today we will explore even less touristic but very beautiful region of Georgia, sandwiched between Racha, Imereti and Svaneti – this is Lechkhumi region. Rioni valley here turns in narrow gorge with breathtaking views. On the west we will see gorgeous rocks of mystic Khvamli mountain. We will enjoy untouched nature, visit waterfalls Gvirishi and Nikordziri, off road drive to Orkhvi mount to see st. George church ruins and enjoy marvelous views. We will visit village Tvishi. Only here in micro zone grows grapes Tsolikauri, which produces unsurpassed white semi-sweet wine Tvishi. We will meet local wine maker, who will show his vineyard and explain details about wine making, here we will make barbecue on nature and try Tvishi wine. After dinner at hospitable wine maker’s place we will return to Chateau Dio. 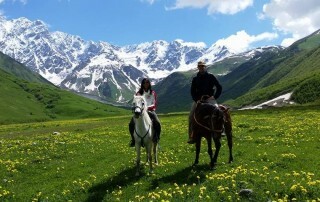 Today we will again return to Lechkhumi, but in Tskhenistskali valley. On the way we will cross picturesque Orbeli pass and get to the west slopes of Khvamli mountain, where are located unique vineyards of grape Usakhelauri. This variety of grape doesn’t grow anywhere else and needs big care. Name Usakhelauri means Nameless. From this grape is produced saturated red semi-sweet wine, which is the most expensive wine in Georgia . We will visit this unique vineyard, try wine and lunch in nature. After this nice meeting we will continue journey to region Imereti, village Kinchkha where we will meet wine Aladasturi – red semi-dry. In Kinchkha we will visit breathtaking Kinchka waterfall and Lomina waterfall. Our wine tour is ending, we will return to Kutaisi, but on the way we will see beautiful Okatse canyon. Here wine tour in West Georgia will end. PRICE INCLUDES: Comfortable vehicle, Driver/guide service, hotels, meals as per itinerary, wine tastings as per itinerary, entrance fees. 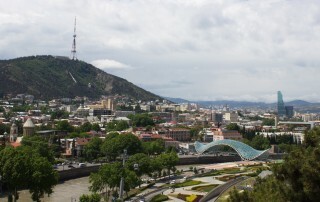 PRICE DOESN’T INCLUDE: Price for souvenirs; additional meals, hotels in Kutaisi, Transfers from/to Kutaisi.